The US alone has Halloween candy sales of about 2 billion dollars annually. 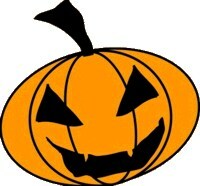 The 2nd most commercially successful holiday is Halloween, behind Christmas. The states are U.S. leaders in pumpkin growing are Illinois, California, New York, and Ohio. Combined, they produce more than 100 million pounds of pumpkins each year. Orange was chosen because of its association with the fall harvest and black was chosen due to its association with darkness.Orange and black are traditional Halloween colors for a reason. Join in and write your own page! It's easy to do. How? Simply click here to return to Funny Interesting Facts.